Home » With Our Missionaries » Africa » Angela Kruse: Who Will Hear the Name of Jesus From Your Lips? “From one man, He made every nation of men, that they should inhabit the whole earth; and He determined the times set for them and the exact places where they should live. God did this so that men would seek Him and perhaps reach out for Him and find Him” (Acts 17:26-27). This passage of Scripture has spoken powerfully to us after returning this past June from Northern Uganda where more than one million Southern Sudanese crossed the border fleeing war and famine. The sheer number of refugees is overwhelming, yet what God is doing through this crisis must be proclaimed. God has allowed one million Southern Sudanese into Uganda’s predominately Muslim North. Coincidence? We don’t think so. Christians are actively sharing the gospel with their Ugandan Muslim neighbours. Our first Sunday in the town of Arua, northern Uganda, we attended a local Sudanese church that met under a mango tree. We recognized Martha from the Dinka tribe. Ten years previously, while serving in a Sudanese refugee camp in Ethiopia, we had sponsored her husband to attend a Bible school. At a weekly Bible study that I held, Martha asked for prayer as her Ugandan neighbours were practicing witchcraft and she was deeply troubled. We prayed for protection and an opportunity for her to share the gospel. That week, the children in her neighbour’s home became ill. She brought them food, paid for their medicine, and shared the gospel. Barely managing to feed and clothe her six children, she shared Christ to her neighbours in word and deed. While over 80 per cent of the population are women and children, dozens of active churches proclaiming Christ each Sunday in every refugee camp. Women serve the sick and the poorest among them while caring for relatives’ children and orphans in addition to their children. Pastors and evangelists have joined different denominations of churches together so they can more effectively use their limited resources. Children and youth choirs actively praise God each Sunday morning and share the gospel during the week. 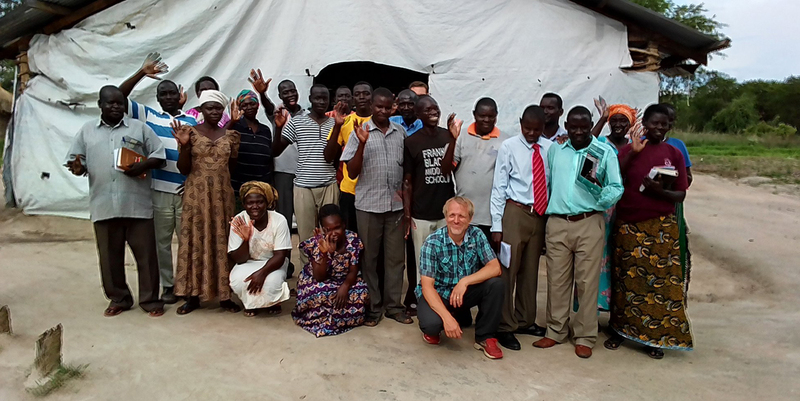 The refugee camps in Northern Uganda have become hubs for training Sudanese leaders in church planting, leadership, TEE and discipleship. The refugee camps and towns are a safe for women to raise their children while their husbands continue ministry in volatile places. How should we respond to refugees or immigrants entering our countries from places that are hard to send missionaries? God is using circumstances like war, famine, and persecution so that every nation might hear the good news of Jesus Christ. How should we respond? Recognize God is actively at work. Be ready to help God’s people in need. Practice hospitality and share the gospel in word and deed. Refugees are coming to our towns and cities. Do they see your spiritual fervour and your faithfulness in prayer? Who will hear the name of Jesus from your lips? Angela and Rolf Kruse (Rosenort FC) serve with SIM in Uganda.